Long days of the sunshine, cool water, pool time and plenty of food often surround fun travel and vacations and by the time night time at the beach wraps around, as parents, adults, we often find ourselves wiped out. During the average day at the beach, most of us walk at least a mile, tote baggage(literally), chairs, and sand buckets, food prep or figuring out where to get food, all the while struggling with the challenge to detach from the world, and leaving our smartphones packed away. I find it is hard to stay detached from the world because what if.. someone needs me (really? ), texts me the most important information of my life or if I need my phone for an emergency? I guess there is no detaching from the smartphone, not even willpower, but is there a way that the smartphone might help me with some fun for night time at the beach? 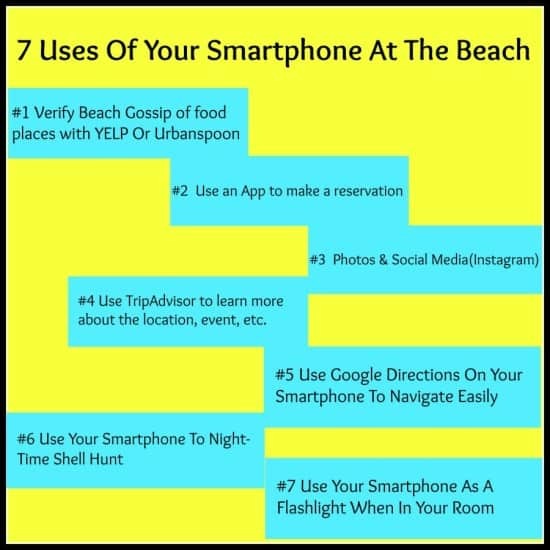 Are there 7 Uses Of Your Smartphone At The Beach that would make it ok to go ahead and pull it out, and not seem like you are caving into technology rather than committing to your vacation? I know many people say that if you are on vacation act like it, but one of the most used pieces of technology actually has benefits beyond work and it should be used guilt-free! Once settled on the beach, I begin watching the waves crashing in, and the kids are running up and down the beach, and then begin creating massive sand structures, we are well settled for the day. The urge is tugging at me to pull out my smartphone but not to work, here are 7 Uses Of Your Smartphone At The Beach each that offer practicality and functionality to everything you are already doing, yet they ease the rush, timing and thought process because the 7 uses of your smartphone at the beach creates mental organization long before you begin to travel on your vacation. When we arrive there at night, we will be seated while others will be waiting! I call this a rockstar move! I listened carefully and as soon as she spewed the name of the place, I Googled it, called and found out they only did first come, first serve and that would never work. The app works like a hidden treasure because those seats are golden and not everyone takes advantage of this app. After getting this all settled, the kids were beckoning me to come and hang out with them in the wet sand to BUILD a sandcastle, and of course, I was not going to miss this fun in the sun, so I took off, but kept my smartphone around my neck. The purpose of the smartphone with me was twofold: Instagram photos and photos. I love my smartphone camera and I don’t think I would trade it in for anything, and of course, you know I am Instagram Addicted, so I am proud of all their time on the beach, and I want to share it! While we are hanging by the surf, toting buckets of water to the soon-to-be Sand Creation, someone is talking about a mini-golf place, and yet another person (Complete Stranger from what I could tell) had a totally different opinion and chimed in. My resolution to this…. TripAdvisor! I actually found out that they were both right on their opinion of this particular place because it seemed pretty split on TripAdvisor, so we steered clear and this time we chose here for Mini Golf. Since I had planned an outing for dinner already and now wanted to get from the Dinner place to the Mini Golf, I decided to use my Google Directions to get the most accurate timing and road closures. Did you ever notice that when YOU are on vacation the most roads seem to be closed? I mean the roads that are the main throughways? We experienced that In Myrtle Beach last year and sat in traffic for over 1 hour to go about 2 miles, it is very frustrating and I did not think to use my Google App then, but I NOW know! Once we got back home from our outings, it was kind of late, but there was a lot of activity on the beach, and Curious IS as Curious DOES, so we took off back to the beach. No, no one was night swimming, but EVERYONE, in fact, had their smartphones out and guess what they were doing? That’s right, we headed out and shell hunted, and I had to run back for a bucket for each kid, but what fun they had with everyone else on the beach. Finally, we headed back to the room, and of course, unfamiliar with the room we were in, as we are always, somewhere new, I used my smartphone to Light the way with my cool Flashlight App. I turned on the smartphone, turned on my App and guess what, I found the switch to light up the room so we could enter with ease. There are so many uses for your smartphone while you are at the beach, that it seems you will not be keeping it separated from you, rather as a part of you. Lavishly living life out loud to me includes keeping my Apps set for travel, letting me be organized ahead of time, and not ending up in bad restaurants or in large waits, because that is not fun when I am traveling. Organization, the ease of getting into places, traveling to where the fun is based on what I learn during my day at the beach in addition to what I already know, keeps the fun moving and the smiles gleaming. I love having my phone with me, and if there is ever an emergency or the need for light, it is at my fingertips. I do highly suggest a waterproof bag of some sort, as I do not take mine anywhere without being the water pouch, because while the Sun, Sand and Water is great for me, it is not for my smartphone. Lavishly live travel out loud, foot loose, and fancy free with these 7 reasons to use your smartphone at the beach. I had almost forgotten that my phone can also be used for phone calls. How technology has changed how the simple phone works. Excellent points!! I appreciate your points. Thanks for giving a great suggestion. TripAdvisor and Yelp are very, very helpful especially if it’s your first time at a place. Of course you want your vacation to be stress-free, right? These two apps will give you valuable tips and recommendations! When we go to a beach, all we can think of is to use our phones to take pictures. Actually I’ve never thought of using my phone to checkout local restos. That’s a very neat idea Dana! This is the reason why I love water resistant phones I can do selfies without worrying about it getting wet. Is is not available for a smartphone yet but the prospect intrigues me. While I do have a smart phone I just use it in the hotel but if it is beach time then it is off. It is nice to enjoy the scenery at times without technology disturbing it. i always do those stuff when im on a vacation. I literally cannot function without my phone, everything is in here. Not many people know about the flashlight function of smartphones. Because of its being high-tech, people tend to forget that it is still a phone loaded with basic features like a calculator, compass, and flashlight! In third world countries stealing anything to survive is a thing and high end phones are targets. I have been there I almost got mug for it so I choose function over flare. Whenever I am at trips I always leave my high end phone at home. Why? Safety!!! In here high end phone can cost you your life. A check on all of that! And, as I have read somewhere, it can even make coffee now! At least after purchasing a special casing of sorts. I’d like that! Oh! Wherever I go even in my vacation time I never left my phone at home. I could not afford not to capture the best moments I am experiencing during my trip. “if I need my phone for an emergency” What I think that, if you do not bring your phone in a day, you might not feel comfortable, especially for urgent purpose. I usually leave my phone in the hotel room. My reason? Total unplug. However, I think your list is going to be a beneficial for those who take their smartphones with them on the beach. Will share this with my daughter too. The one way I’ve figured out how to let go of the smartphone, especially on vacation, is I tell myself, *IF* there is an emergency, there’s nothing I can do about it anyway. I mean, heaven forbid something does happen, I’m so far away plus the doctors (if needed) can do a much better job than I would be able to! ha I guess this is just a little thing I tell myself so that it’s easier to let go and enjoy myself, it is a vacation after all. Numbers 2, 3, 5, and 7, I do. Had to buy some accessories to keep my phone safe from the element though. What would be good shockproof and waterproof case? I thin that would be a good follow-up for this post! The only thing I ever use my smartphone for at the beach is number 3! Your list just made me realized how underused my device is! Thank you so much for waking me up! Being on Instagram is the best part of me, and that is if the signal of the internet is good. Most of the time it is good but some times the internet is so slow. I am now considering some parts of your top 7 and I never thought there are lots of things we can use our phone with. Great suggestions. I use Tripadvisor a ton when we are out and about, we have found great beaches and things to do. Great ideas for sure. I use it mostly for checking places to try new food at. Greta ideas for using the phone at a beach. I try to leave mine in the room, but that can be inconvenient at times. A smartphone can do pretty much everything, just like these things you’ve listed. Just be careful not to drop or get your smartphone wet. Salt water will definitely do irreversible damage on your phone. These are great way to use your phone at the beach. I love being able to use my phone when I go to the beach. i take lots of pictures and play games. Wow some of these I wouldnt even think especially for the beach! Really great to know we are heading to the beach in a couple of weeks! 1Great tips!! A smartphone is really important when traveling! It is now a must-have for me whenever we travel. Toni recently posted..Cuisinart 5-in-1 Griddler and $50 Amazon.com Gift Card Giveaway! I use TripAdvisor for everything on vacation! I have found the best spots by reading reviews and searching the area with the app! These are all great uses for your phone. I love, love, love the yelp idea. Very clever! I also didn’t think about night time shell hunting. My kids would thoroughly enjoy that. Some people don’t realize how useful smartphones are especially when you’re on vacation. These are basic tips but they sure are so helpful! Thanks! Spring for a waterproof pouch and you can use it to take some amazing underwater photos! There are so many amazing things that you can do with your phone! I love your suggestion to look up the location and/or event right from your phone so you know what to expect! When I’m out traveling with the kids, my smartphone is my lifeline. It helps me with everything, especially when it comes to finding our way to the different spots that we want to explore. These are great uses for when you’re at the beach! Having a smartphone with you when you travel makes taking photos convenient. That’s what I usually use it for. I think these are all awesome uses for smartphones! I definitely like the idea of making a reservation right from my phone. I may have to try that app. I like the idea of hunting for shells at night too! The phone on the beach has now came of age and your ideas are great for our next beach outing or trip. I was not aware of all the uses for my smartphone on the beach. I think using my Google Maps is a great tips. These are some great tips I wouldn’t have thought of using Trip Adviser on my phone to look at things to do in the local area, I always check online before heading out, but on they day you might fancy something different. Well I guess I can use my phone for more than beach selfies! What an awesome post. I have some great ideas for my phone thanks to you the next time I go to the beach! This post is so me. I use my phone so much when we go to the beach. I’m an Instagram fiend on the beach. I love this! Our phones can be used for so much. I think it’s great to remember to put them to use on trips like this. Those are all great ways to use the phone more at the beach. I will have to try some of these!! #4 and #5 are my favorites since I have no sense of direction sometimes and I always, always have to learn enough where I’m going before actually making the trip. But #6 is what I’m so looking forward to try! It’s hard to pull out your smartphone during a beach outing specially when your smartphone is prone to getting dirty and not entirely water resistant. With that said, the pros of bringing along a smartphone far outweighs its cons, taking photos and restaurant reservations are merely the tip of the iceberg, this post keeps me filled with ideas! Right on point! Smartphones are more than just for taking pictures. Nice way of sorting out its uses at the beach. First and foremost, we need our phones for emergency situations. Secondly, for practicality (flashlight). I can get off the grid when on vacation, but I would still keep my phone within arm’s reach, just in case. Who shuns their smartphones at the beach? I’m addicted to Instagram too so I can’t be without my phone. If I see something beautiful and Instagram-worthy, I’ll take picture. Smartphones are useful for traveling in general. But I have to agree with point #6 and 7– you never know when you’ll be needing that flashlight app. A smartphone isn’t primarily made to be a flashlight so it’s always cool when it saves your day just because it has that feature. Yeah, that phone light has come in handy for me a few times! Especially when trying to fumble for my car keys at night. Well it’s always nice to have some selfie and take a picture of the good view. That’s all I ever do and it’s fun! This is right! We all do this. You can really do a lot with just your smarthphone! These are great tips on how to use your smartphone wisely when on vacation. Thanks for sharing! I always do number 7 whenever I am. That flashlight feature is a must have in particular in trips and dark places. I am not so much into flashy features but my phone has always a FL function. Usage number one is what caught my eye ” URBANSPOON? YELP? Oh boy I Must catch up with my tech ha ha. Anyway, the most common use of phones these days are selfies. I got that right. Excellent! The smartphone is the essential tool for any exotic travel. It’s good to capitalize on all its useful features so you’re well equipped for your trip. This is a real timely article for my family. We already have our reservations set for our annual shore trip. The information posted here will be of great help to us. Thanks!